Quick description: Souchong smoked over pine fire, smoky taste. Lapsang souchong is a black tea originally from the Wuyi region of China province of Fujian, an area that has produced some of the best teas for centuries. It a unique type of tea because the leaves are traditionally smoke-dried over pinewood fires, taking on a distinctive smoky flavor. The tea originated through a creative response to a threat to the tea crop one year, in which the villagers of Tong Mu quickly dried their crop over freshly cut pinewood. Unexpectedly, European customers enjoyed the smoky flavor and the new type of tea became popular. 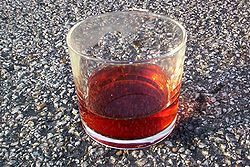 A type of black tea, Lapsang souchong is not drunk specifically for health benefits, although black teas too are considered relatively healthy beverages. Also, unlike many varieties of tea, it did not originate as a specialty for the elite. Lapsang souchong is rather an example of how human beings have been able to take an obstacle and, through adopting creative measures, transform it into success. The name Lapsang souchong in Fukienese means "smoky variety" or more correctly "smoky sub-variety," where souchong refers to the large leaf type of tea bush that grows in the Wuyi Mountains of Fujian from where it originates. Its distinctive smoky flavor sometimes causes it to be referred to as smoked tea, or "tarry lapsang." The tea is traditionally made in villages on Zhen Shan Mountain, using special wooden smoking sheds. The large leaf tea is plucked and partially processed in the surrounding area, and then brought to the sheds to be smoked over the fire and given a final drying. The processing uses pine wood fires, or alternatively cypress wood may be used to dry the leaves. After panfrying and rolling, they are pressed into wooden barrels and covered with cloth to ferment until they give off a pleasant fragrance. The leaves are fried again and rolled into taut strips. Then they are placed in bamboo baskets and hung on wooden racks over smoking pine fires to dry and absorb the smoke flavor. When finished they are thick, glossy black strips, and produce a dark red beverage with a unique aroma. Lapsang souchong should be brewed in 100 °C (212 °F) water for three to four minutes to produce the best flavor. It should be strained and more water added for second and third infusions. Lapsang souchong is a tea that was created by accident not design. The Wuyi Mountains were famous for their large leaf oolong teas, and it is from these that lapsang souchong comes. In 1646, during the reign of the young Qing emperor Shunzhi his uncle, the chief regent Prince Dorgon, attempted to bring the province of Fuijan under Manchu rule. According to local lore, when the army invaded the Wuyi Shan area the villagers of Tong Mu attempted to hide their tea from the soldiers. The Jiang family has a history of 24 generations of tea makers in Tong Mu village and claims the honor of resourcefully inventing this tea. To prevent it from rotting they quickly dried their tea harvest, heating it by burning freshly cut pinewood from the surrounding forests. Upon their return they discovered that the tea was dark and had a strong smoky flavor; they considered it ruined. However, when Dutch traders came to buy tea as they had been doing for several years, the villagers offered this "special" tea to them. Surprisingly, the Dutch were impressed and returned the following year to buy more, even offering a higher price than for the usual teas. The tea was easy to reproduce and became known as bohea. In the local dialect it became known as lapsang (meaning pine wood), and as the term bohea became used broadly for many dark teas the term souchong was added to distinguish this large leaf variety from the Wuyi region. 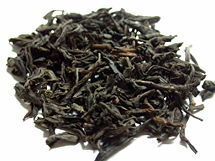 A black tea, lapsang souchong has a rich color. Lapsang souchong's flavor is strong and smoky, similar to the smell of a campfire or of Latakia pipe tobacco. The flavor of the pine smoke is meant to complement the natural taste of the black tea, but should not overwhelm it. However, the flavor is very distinctive, with the result that people either love it or hate it. Variation occurs in the strength of the flavor of the tea and the intensity of the smokiness. Less smoky varieties are thus available for those who prefer only a little smoke flavoring. When drunk as a tea accompanying food, Lapsang souchong's strong smoky flavor is particularly good with salty and spicy dishes and also with cheese. It is also delicious when drunk beside a warm fireplace. Its smoky flavor may also be used to add a distinctive tang to a variety of savory culinary creations. For example, when added to mayonnaise Lapsang souchong gives an appropriate flavor for a smoked turkey sandwich. Lapsang souchong imparts a smoky flavor to oven roasted meat even when the oven is kept at a temperature low enough to achieve a tender roast. Because of this quality, Chinese cooks smoke a variety of foodstuffs over smoldering Lapsang souchong tea. The highest quality tea of this type, Zhen Shan Xiao Zhong, is rarely available outside China. Since it is made from the small early leaves grown in the Tong Mu village area there is only a short time to pluck them, resulting in a small amount being produced each season. At a relatively high elevation, Tong Mu’s winter is colder and longer than the rest of the Wuyi region, which encourages a concentration of amino acids in Tong Mu’s tea leaves. In combination with a soil rich in minerals, this results in tea with a characteristic sweet, fruity character. Tong Mu is poorer that the lower Wuyi Shan region. Thus tea makers in Tong Mu burned the readily available pine as a heat source for processing their tea, rather than using the more expensive bamboo charcoal that was commonly used by other tea producing regions. This is a clear example of a zen jhen tea, a tea whose terroir, "a sense of place" (the unique effect of the soil and climate combination of a specific locale on products grown there), as well as its unique processing technique makes it impossible to duplicate elsewhere. Zhen Shan Xiao Zhong tea is smoked differently from Lapsang souchong, resulting in less absorption of smoke and also less loss of the delicate flavor of the young leaves. The product is a tea that has the familiar smoky flavor but is sweeter and more refined. The smokey quality of Zhen Shan Xiao Zhong is derived from the earthen ovens of Tong Mu village. The tea is put on bamboo baskets and slow roasted over the pine fire heated earthen ovens for 8 to 10 hours. The design of these ovens warms the ground of an enclosed space that is floored with rocks to provide radiant heat. The ovens leak a certain amount of smoke, which can be adjusted to vary the desired smokiness of the tea's flavor. Chinese tea makers who moved to Taiwan developed a strong tea industry there, cultivating a variety of teas including Lapsang souchong. Although similar to the original in terms of method of production, the Taiwanese tea is stronger and more heavily smoked. Several companies market Lapsang souchong tea bags. Lapsang souchong from the original source is increasingly expensive, as Wuyi is a small area and there is increasing interest in this variety of tea, having become popular in Europe and also the United States. Over the years Lapsang souchong tea has suffered many transformations as tea producers would take old tea, smoke it heavily, or even add chemicals with smoke flavor, and sell the result as Lapsang souchong. Lapsang souchong is also sold in tea bags, although this does not necessarily imply a loss in quality of the tea. ↑ 1.0 1.1 Jane Pettigrew, Bruce Richardson, The New Tea Companion (Perryville, KY: Benjamin Press, 2008, ISBN 978-0979343179). ↑ 2.0 2.1 2.2 2.3 2.4 2.5 2.6 Mary Lou Heiss and Robert J. Heiss, The Story of Tea: A Cultural History and Drinking Guide (Berkeley, CA: Ten Speed Press, 2007, ISBN 978-1580087452). ↑ 3.0 3.1 3.2 Green Dragon Enterprises, The Production of Black Tea, Seven Cups Fine Chinese Teas. Retrieved February 5, 2009. ↑ Kit Chow, Ione Kramer, All the Tea in China (China Books & Periodicals Inc., 1990, ISBN 0835121941). ↑ Elizabeth Knight and Bruce Richardson, Tea in the City: New York (Benjamin Press, 2006, ISBN 0966347870). Chow, Kit, and Ione Kramer. All the Tea in China. China Books & Periodicals Inc., 1990. ISBN 0835121941. Knight, Elizabeth, and Bruce Richardson. Tea in the City: New York. Benjamin Press, 2006. ISBN 0966347870. This page was last modified on 27 June 2014, at 20:32.